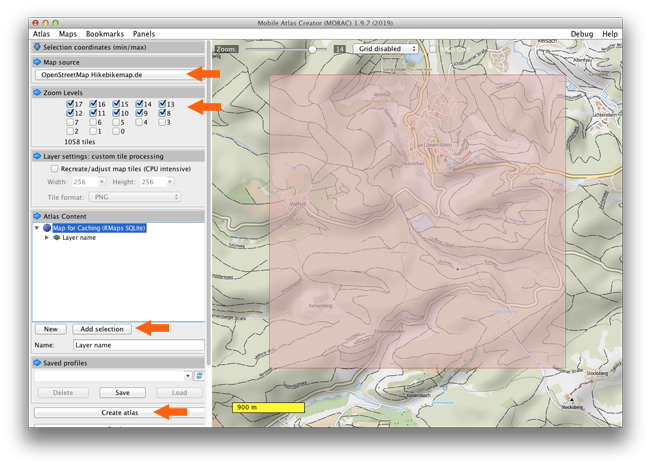 Looking4Cache Pro includes vector maps out of the box. You can download them in a comportable download area in the app. They brings the data of OpenStreetMap together with contour lines. ‘RMaps SQLite': This files you can create with MOBAC. It downloads the ready rendered map tiles directly form the different map servers. Because of the high trafic MOBAC causes by OpenStreetMap it gets blocked sometimes. So you may have to switch the map provider. mbtiles: This files you can create with TileMill. In difference to MOBAC the tiles (256×256 pixel picture of a map) will be rendered localy on your computer. It is possible to modify the style of the maps with StyleSheets. But it is also a litte bit complicated to setup a TileMill environment. Unzip the file in a directory you want (for example Desktop, Applications, Programs). MOBAC will ask you to name the new atlas and select a format. Enter a name ans select the format “RMaps SQLite”. Later you can open this dialog again with the menu ‘Atlas / New Atlas’. But don´t forget to save your atlas as a profile. The usage of MOBAC is quite simple. With the mousewheel you can zoom. Hold the right mouse key to move the map. Select a map source on the top left. Select a area on the map with the left mouse key pressed. The red marked area will be exported later. Select the zoom levels to export. Higher numbers have a larger detail. Click on ‘Add selection’ to add the zoom levels of the selected area to the export. You can add different selections with different zoom levels to one offline map. Click on ‘Create atlas’ to export the offline map. After the map is stored offline you can click on ‘Open atlas folder’ to jump into the directory with the map. Starting with TileMill (download) is more complex that just download the map tiles because you have to provide map data to this program through a database. After the installation of TileMill you have only a program with some examples. What you need to render your own maps is a database containing OSM data and a style for this data. Both you get with OSM Bright. Heres a installation guide for Mac and Ubuntu. Connect your device and open iTunes. Click on your device and select ‘Apps’. Scroll down to the section with apps that supports file transfer. Choose ‘L4C Pro’ here. 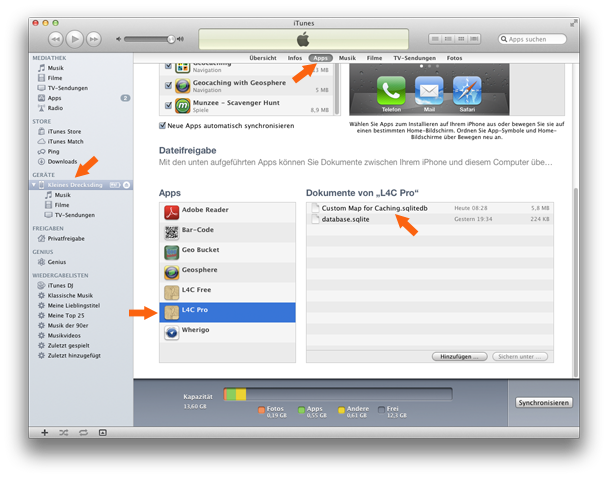 Drag the newly created offline map from the Finder / Explorer in the list of files. The tansfer starts immediately. Note: With iTunes you can also delete maps. Don´t delete the ‘database.sqlite’. Tap the map icon on the map screen. It is the second icon on the top. The offline map will be presented at the bottom of the list. Congratulations! Now you are independent form the Internet while caching.